“Weird Al” Yankovic is, in many ways, the opposite of Donald Trump: He’s a humble, self-made success who seems quite secure with the size of his hands, not to mention that he’s trying to make us laugh when he acts like a fool on TV. 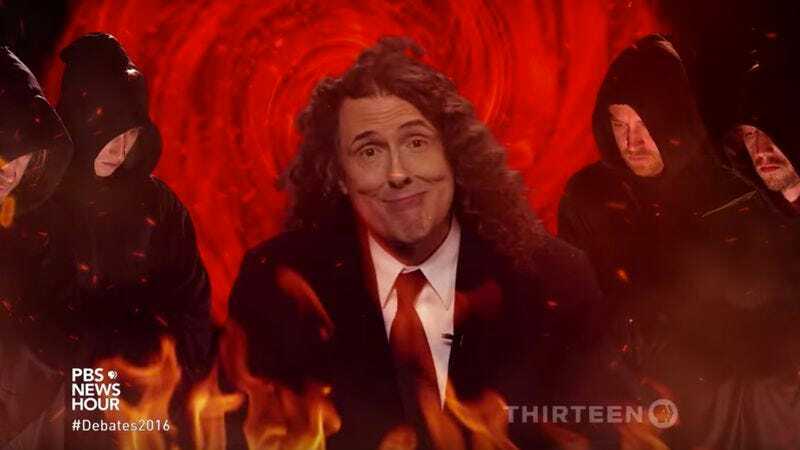 Now Yankovic has stepped in to make this week’s final presidential debate between Trump and Hillary Clinton a little more palatable, asking tough questions, like “Would you thumb wrestle Vladimir Putin?”, as a vortex to Hell opens up behind him. And if you think all this sounds awfully similar to those “AutoTune The News” videos that were so popular in the early days of YouTube, you’re correct: The video was produced by The Gregory Brothers, who popularized the style circa 2009-2010 and whose current mission is to “songify the universe,” according to their YouTube page.